ALL ORIGINAL!!! Box has minimal wear. Thor is in GREAT, UNUSED SHAPE!! We love to find these with a helmet that still shines! A couple of small pin prick sized litho spots at the base and lower flap. 1975 Mego WGSH 8" Type 2 Action Figure- Thor ~100% Original & Complete ~MINTY! Displays awesome and all original Mego! Brand new in original box never opened 8" scale size action figure!Original body marked Mego 1974: Original head marked 1975: Beautiful paint. Long blonde hair is clean and neat!Original suit: Vibrant colors with no stains, rips, runs or holes. Snaps and belt firmly in place. Boots in excellent shape.. Helmet looks excellent overall..Since we all have different definitions of "mint", "good" etc... check out the high quality pictures and make your own judgement of the condition. This one should qualify as mint or very close to it by most people's standards! Vintage Marvel Comics THOR MEGO on unpunched card !!! 100% ORIGINAL Package and Figure, never opened !!! The package is in good condition ! Sun dying on front of card back is fine. The Thor figure is in mint untouched condition!!! Here we offer a Mego, 8", type 2 body Thor. He is MINT IN BOX. 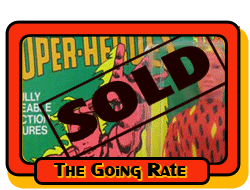 Figure and box are 100% ALL ORIGINAL vintage Mego, guaranteed. This is the early issue issue Thor, NEVER PLAYED WITH, PERFECT CONDITION! Complete with a pristine unfaded bodysuit with all vintage stitches intact as well as the snaps and heat sealed buttons. Nice original like new sheen to the material. Super tight T2 body and clean hands. Original head has all vintage paint intact, perfectly styled hair too with original hair band. Pristine red cape factory attached with tight neck elastic. Original helmet has all of the vintage chrome plating intact, perfect. Original Hammer minty, no defects. Original wrist cuffs have vibrant color, still snug around his wrists. Finally, his original Mego boots are also in mint condition, zero defects. A BEAUTIFUL mint condition, first issue Thor. Original Mego box is really nice. Marvel heroes on side panels. Vibrant color on all panels. All tabs and flaps intact. No tears, just a few wrinkles and some shelf wear on the edges and corners. Nice 90 degree panels all around. NO Price tags. UNPUNCHED. Original window is firmly intact all around, clean and clear. Original insert minty and nests the figure well as seen in the pics. About as nice a Thor box as you will ever find. Hammer, helmet, boots, cape, and wristbands all included. Suit is clean but does have some minor staining.